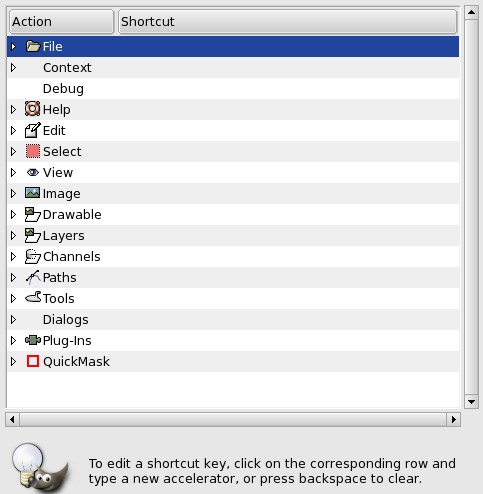 Many functions which are accessible via the image menu have a default keyboard shortcut. You may want to create a new shortcut for a command that you use a lot and doesn't have one or, more rarely, edit an existing shortcut. There are two methods for doing this. First, you have to activate this capability by checking the Use dynamic keyboard shortcuts option in the Interface item of the Preferences menu. This option is usually not checked, to prevent accidental key presses from creating an unwanted shortcut. While you're doing that, also check the Save keyboard shortcuts on exit option so that your shortcut will be saved. To create a keyboard shortcut, simply place the mouse pointer on a command in the menu: it will then be highlighted. Be careful that the mouse pointer doesn't move and type a sequence of three keys, keeping the keys pressed. You will see this sequence appear on the right of the command. It is best to use the Ctrl+Alt+Key sequence for your custom shortcuts. You get to this Editor by clicking on Configure keyboard shortcuts in the “Interface” item of the Preferences menu. This shortcut editor also allows you to control the tool parameter settings with the keyboard. At the top of this dialog, you can find a Context menu that takes you to the tool parameters. To make your work easier, tool types are marked with small icons. C:\Documents and Settings\[Username]\.gimp-2.8\menurc under Windows XP. C:\Program Files\GIMP 2\etc\gimp\2.0\menurc under Windows 7. C:\Programmes\GIMP 2\etc\gimp\2.0\menurc under Windows 10. More, this location may change if GIMP is installed after having already installed Git Bash or Cygwin. In this case, they will appear in C:\Program Files\Git\.gimp-[version]\menurc. “menu.rc” is a simple text file that you can transport from one computer to another.